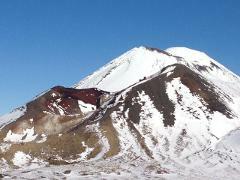 One way transport from the end of the track (Ketetahi) to the beginning (Mangatepopo). 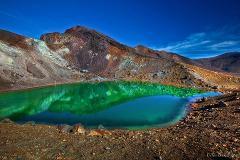 Park in the private car park all day at the Tongariro Shuttle Car Park at no extra cost when you book with us. Return transport available from most accommodation places in Taupo, from the Taupo I-site or another convenient location. 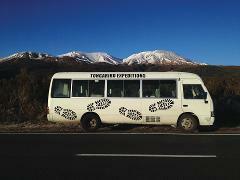 Return transport available from Tongariro Holiday Park to and from the Tongariro Alpine Crossing. Return transport available from most accommodation places in Turangi, from the Turangi I-site or another convenient location. 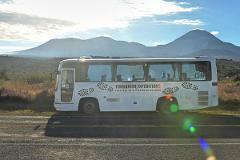 This service is usually used if you are accessing the Tongariro Northern Circuit. Please contact us to get advice on this before you get your hut passes. There are many ways to do this. This is NOT a guided trip. We specialise in freedom hiking options in winter. Our Track Safety Package includes transport, crampons, poles and map for $95. This trip is highly dependent on track conditions and the weather.